A recent study by the University of Michigan yielded unwaveringly positive results for the impact of a youth theater program on its participants, solidifying the need for arts funding in schools and extracurricular programs. Quite encouraging news to this member and supporter of youth arts programs, as we finally have some hard and fast fact on our side. 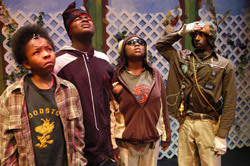 Founded by actor Rick Sperling, the Mosaic Youth Theatre is an arts organization which educates children in all elements of theatre, both on and behind the scenes, in Detroit, Michigan. Like most non-profit founders, Sperling was driven by the innate sense that he was having a positive influence on the participants of Mosaic, but had a hard time gaining credibility with outside organizations and schools. After the completion of a three-year evaluation this May, conducted in association with the University of Michigan, Sperling gained this long-sought credibility. The study showed that the Mosaic Youth Theatre had resounding effects on the lives of the students involved, both during and after their participation in the program. Ninety-five percent of Mosaic alumni graduated from high school, and eighty percent of alumni who participated in the survey were enrolled in, or had graduated from college. These numbers are astronomical when compared to Detroit's average high school graduation rate of 24.9 percent. The study also showed high results for self esteem growth and societal arts participation in those alumni surveyed. Sperling's study comes at a time when many arts programs are being cut from state school budgets, and the scientific findings are a much needed boost to the youth arts movement. The study is a reminder that art is an important part of education, and its funding is critical to the positive growth of our nation's children and our society's culture.